Can the paint be applied over any substrate? In almost all cases, the answer is yes. Any paint can be applied over any type of surface as long as this latter has been properly prepared and/or primed with the specific adhesion primer. Without adhesion primer, the paint adhesion cannot be guaranteed! Some substrates, such as metal, plastic, glass, concrete, leather, etc., require a primer. Other irregular substrates, such as wood, require a primer to smooth the surface. Other supports, such as old paints do not require primers; a light sanding is sufficient to allow them to be covered while ensuring a good adherence. Discover a wide choice of primers in the category "Primers"
The cost is calculated by the website. Can we ship products abroad? We deliver throughout Europe. Caution: shipping flammable products by airplane is prohibited. For this reason, we cannot deliver flammable paints in French overseas departments and territories or countries outside Europe. For these countries, please contact us by email so that we can offer shipping solutions or similar replacement products. Do aerosols give the same paint quality as paints in pots? Our aerosols are filled with the same paints. Yet, the quality of application cannot be identical when spraying with an aerosol or a spray gun! It’s important to understand that aerosols, although cheaper than paints in pots, are less economical: A 300ml aerosol contains only 100ml of paint + gas. 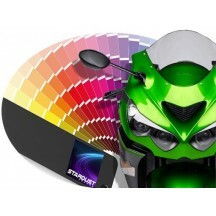 Are Stardust Colors products compatible with other products? In general, without any guarantee by us, all professional products, bodywork or industry paints, are compatible with each other. 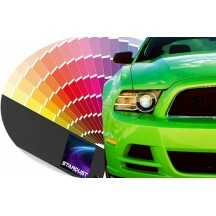 Car body paints, whether water- or solvent-based, are compatible with each other. Nevertheless, to prevent eventual reactions or defects, we recommend to use our bases to topcoat, or primers, for the backgrounds, and our automotive clearcoats for the finishes. On what background colour should I apply my paint? Most of our special effect paints need to be applied over a particular background colour (usually white or black) as they are semi transparent. The background colour is different depending on the type of effect and also according to the colour reference. On each product sheet can be found the instructions for the background colour, and sometimes (as is the case for Diamond paints) a PDF with a link in red to a table for the background colours. How do I know the packaging and application instructions of the product I want to order? On each product page of our website can be found the available packaging (to be selected from the drop-down menu). There are also detailed instructions for paint application, information on the paint yield and additional tips. PDF documents to be downloaded (technical sheet, safety sheet, additional advices...) will be found on most product pages ; we strongly recommend that you study them. Does Stardust Colors apply paints? We manufacture paints and sell them. 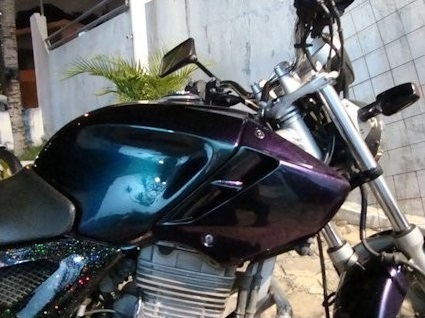 For paint application, please contact a car body painter or an industrial painter. You will find on our page the map of applicators classified by department. Which gun nozzle should I use for my paint or topcoat? Generally, most of the paints we offer can be applied with nozzles of 1.0 to 1.5mm. Our paints can be used with airbrushes (0.5 mm nozzles for example) with the proper thinning. Can we apply your water-based paints on the skin? Can we distribute Stardust Colors products? Yes, in mainland France, in Europe or abroad. > Outside Europe: Exclusivity possible. The conditions are the purchase of a stock with shipment by seafreight. Discount of 40 to 50%.